Another Cape Cod weekend was upon us, and guests were arriving Friday night after a long, hot drive on the interstate with two small children. We figured that after many hours in the car, they would like something light and refreshing, but filling. 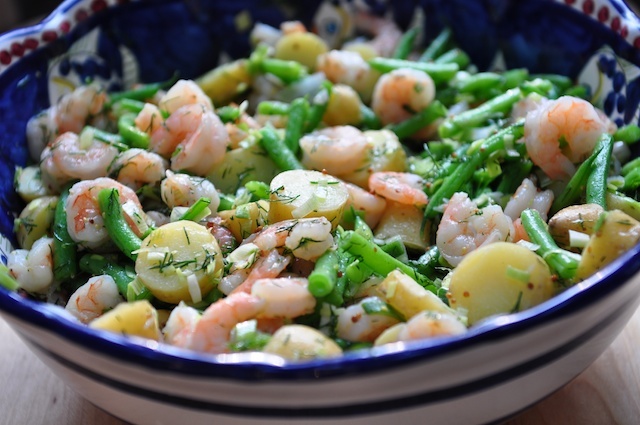 We settled on Shrimp Salad with Potatoes and Green Beans from Williams Sonoma’s Weeknight Fresh + Fast, served with crusty French rolls from Pain d’Avignon in Hyannis (what a find that place is!). That afternoon we visited a number of the farm stands along route 6A, and managed to procure everything needed for the salad except for the frozen shrimp. 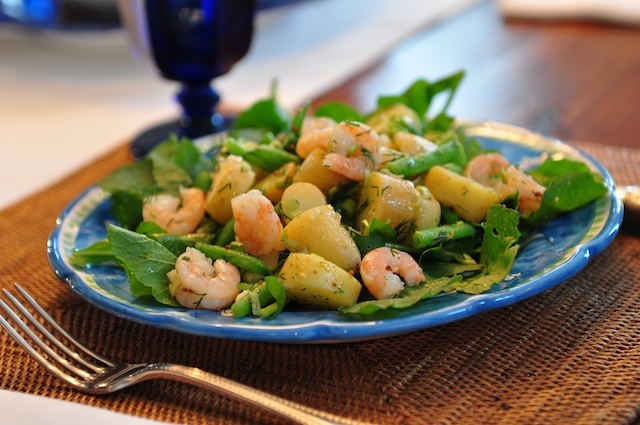 We substituted fingerling potatoes for the large ones called for in the recipe, and served the salad on a bed of fresh arugula. A crisp, cold Kim Crawford Sauvignon Blanc was the perfect companion.